NOBLE CHAFER GNORIMUS NOBILIS ­ YET MORE RECORDS! An issue of Worcestershire Record without mention of Noble Chafers is highly unlikely these days! For more information please look at earlier issues or the web site www.wbrc.co.uk. Further survey work in 2005 has revealed several more orchards harbouring these rare and important beetles. Typical frass and living larvae were found in two orchards near Drakes Broughton. This find is particularly useful because Kevin McGee has regularly seen flying beetles in that area so this year’s evidence gives some indication of their breeding places. More recently exploration of orchards near Cleeve Prior also revealed similar evidence, although only in two decaying plum trees out of about 200. Matt Smith undertook contract survey work in west Worcestershire for the People’s Trust for Endangered Species (PTES) who are the lead partners in the national Biodiversity Action Plan. He found a living beetle digging its way into a decaying plum tree in one orchard and frass in trees elsewhere in the area. We now have records scattered throughout much Worcestershire although many areas remain to be explored, especially in central and NE parts of the county. Are there Noble Chafers in the Redditch area? How far north does the range extend in the centre of the county. Ideally every old orchard in the county should be searched! The accumulating evidence points to Worcestershire and parts of Gloucestershire and Herefordshire being of national importance for this rare beetle. In this area they have been found only in old orchards where the trees show the right sort of heartwood rot. Old plums appear to be the most widely used trees, followed by apple and cherry. 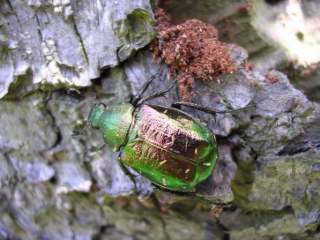 Whether the beetle uses other species of hardwood trees is unknown at present. Also we tend to search low down and who knows what may be going on in decay high in trees? Currently old orchards have very little protection for a conservation viewpoint. Thousands of acres have been grubbed up over the last 50 years. Other orchards become scrubland or woodland and these heavily shaded places are less good for those invertebrates, like Noble Chafer, which like trees in the open where the trunks are warmed by the sun. Current work is showing that old orchard trees are providing important decaying wood habitat for invertebrates, as well as being useful trees for nesting birds, epiphytic lichens, and as nectar and pollen sources for many insects. Recent developments will hopefully lead to grant-aided stewardship schemes aimed at orchard conservation and enhancement. Re-planting is of course necessary in the long term especially if it is done alongside decaying trees left in situ. There is of course considerable interest in preserving old fruit tree varieties as standing trees and through propagation by grafting. Please keep looking for big green beetles! Also if you are aware of old orchards which we may be able to examine for beetles please contact zen130501@zen.co.uk. The rear end of this beetle was noticed sticking out from bark on a plum tree. It was apparently burrowing into the decaying wood. Living larvae arising from this would of course be very difficult to locate. It seems as if generations of beetles may reproduce inside a decaying tree without the adult beetles emerging from the tree.